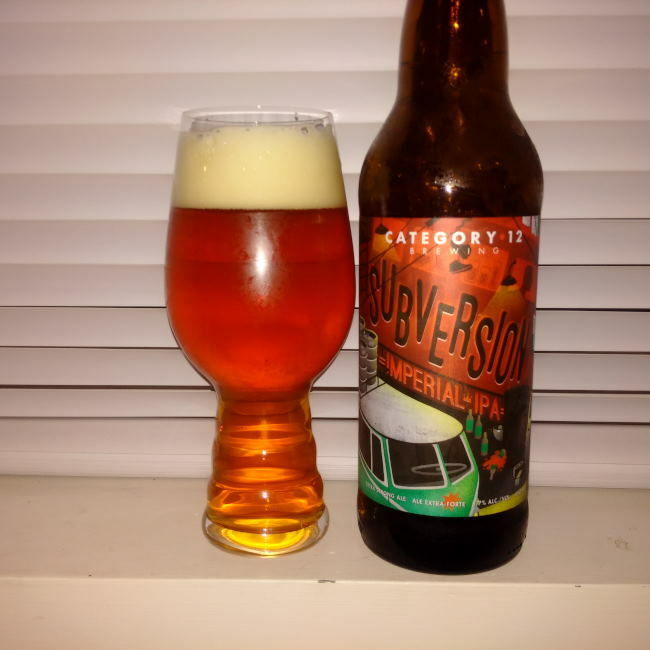 From Victoria’s Category 12 Brewing comes their “Subversion Imperial IPA”. The beer pours a golden orange colour with an off white head. The aroma consists of citrus, tropical fruits, floral hops and caramel malts. The flavour is of citrus, tropical fruits, bready malts, resin, pine, sweetness and a whole lot of bitterness. The beer has an alcohol content of 8.7% with an IBU of 85. This is a really good Double IPA and one of the best in BC right now in my opinion. Commercial Description: A lot can happen under the cover of night. Stealth – but not still – covert operations are taking place. Previous loyalties are being abandoned in favour of new traditions. If you pay attention, you won’t be left behind. Subversion is a big, bold, west coast Imperial IPA. The body is medium-full, so its hop character is truly showcased. This beer will flip you on your head! This entry was posted in Double IPA, Imperial and tagged bc, bitter, bitterness, bready malt, bready malts, canada, category 12 brewing, citrus, citrusy, craft beer, double india pale ale, double ipa, hops, hops bitter, hops bitterness., imperial india pale ale, imperial ipa, india pale ale, pine, resin, subversion imperial ipa, sweet, sweetness, tropical fruit, tropical fruits, victoria.